FileStream.me is a file storage service and free online torrent client that lets you download torrents without ever needing to install software. There are, however, some limitations, which you can read about below. Some of the positive features you can find in FileStream.me include support for resumed downloads, audio and video streaming, and batch downloads. *Resume isn't supported for ZIP files, which means if you're downloading multiple files at once with the bulk download option, you can't resume broken downloads. 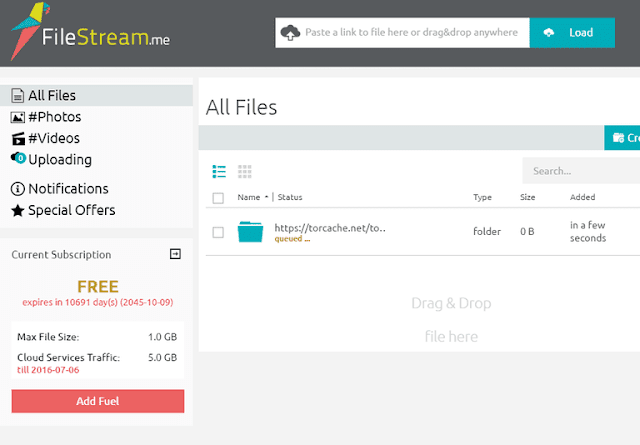 Because FileStream.me has a premium subscription that you can buy, there are lots of restrictions with free accounts. Torrents fetched (loaded) by FileStream.me can only be 200 MB in size, but the total file size of the entire torrent, with all its files combined together, can actually exceed 200 MB so long as you are only downloading files that are less than 200 MB. As an example, say you have a torrent that consists of hundreds of video files that are each 200 MB, but the whole torrent itself is 100 GB. FileStream.me will read the whole torrent without hesitation but will not fetch anything into your account because it won't load more than half a gigabyte at a time, and when you first load such a large torrent, all the files are queued for fetching at the same time. To circumvent this, FileStream.me lets you choose which files out of the torrent that you want it to download. This means you can choose one of the 200 MB files, have it fetched, and then download it without a problem. Then, you'd just have to add that same torrent back into your account and choose a different 200 MB file and repeat the whole process until you've downloaded everything you want. No more than two torrent files can be downloading into your account at the same time. This means you can load one torrent and then load a completely different one at the same time without any issues, but no more than those two until one of them has completed fetching. FileStream.me also limits how long your torrents are stored in your account before being removed. The limit is three days, which means after a torrent has been successfully fetched, and therefore loaded in your account, you have three days to download the files before the torrent gets removed from your account. In addition to the above, FileStream.me limits download speeds for some users, whereas premium members can download files at the maximum speed possible. Limitations occur when a free user's traffic usage goes up to high. While testing this out, my downloads were just as quick as they are with any other website. You're given 200 GB of storage space with a free FileStream.me account. That's hardly a limitation since it's huge, but it definitely isn't as much as the paid options that give between 500 GB and 1,000 GB. Because of its limitations, FileStream.me probably isn't the service for heavy users. For such people, I recommend uTorrent. However, if you need to download smaller torrents and would rather not install software to your computer, FileStream.me is actually very nice. Because FileStream.me doesn't use the BitTorrent network to download your files, download restrictions are less likely to be enforced by your ISP, which can't be said for programs like uTorrent and BitLord. If you're not interested in FileStream.me, be sure to check out my review of ZbigZ, which is another free online torrent client.